Update 3-19-08: Rumors of an outbreak now spreading to schools in Florida and Maine. Visit Treehugger for the latest news on this crisis! Recently, schools across the country have been experiencing increased absences due to a nasty strain of the flu. It appears that children and teachers aren’t the only ones falling ill, but school office equipment has succumb to a different, common disease. In a report just in from the Robert Moses Middle School in North Babylon NY, students and staff there have become concerned by the fact that the school photocopy machine is exhibiting signs of a strange illness. They’re not yet quite certain what it is, but a key symptom they’re reporting is a propensity to chew up trees at an amazing rate before spitting them out in shreds with some sort of toxic goo all over them. And all while consuming vast amounts of water, paper, and energy that’s leading to global warming through the release of CO2. Mr Luna is well known for his bright idea: to give every child in America one compact fluorescent bulb for their home. Perhaps Mr. Luna will solve the current crisis facing school copy machines. 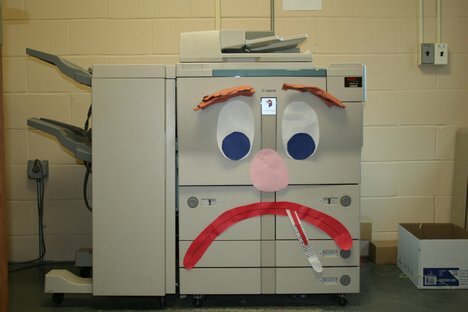 If you suspect your child’s school photocopier may be affected please contact copycrisisteam (@) gmail (dot) com. Expect statements from the presidential candidates and the CDC on this mysterious illness soon. Hey just stopping by to get my dose of green info. Always good stuff here! I am trying to compile a list of stuff I can do to reduce my carbon emissions. MTV had a commercial about it, and got me interested. I have been to earthlab and they have a ton of tips but I was mostly impressed by their page where they have their users send in tips Does anyone else know of other data bases that I can find these types of small things that lower my emissions? EPA or WWF maybe? Thanks for all your info and drop me a link if you guys see anything worth my time. This is a load of crap. Which natural food companies can you trust? 80,000 Chemicals Registered in the US; 1 in 8 Women get Breast Cancer. Can You Say Connection? CPS Removes Illinois Baby Because of Home Birth "Medical Neglect"